I’m always been fascinated by how players and referees in sports respond to incentives, and hockey has provided several great case studies for this. Over the last few years, for example, I’ve taken a vested interest in the NHL’s OT rules (to read more, this is a good reference). In 2013, as part of the league’s realignment, postseason eligibility criterion changed, and teams are now judged relative to opponents from within their division. In prior seasons, teams were mostly judged relative to conference opponents. Overall, through games on January 10, there hasn’t been any significant changes in the rates of teams playing for OT by game type (divisional, etc). 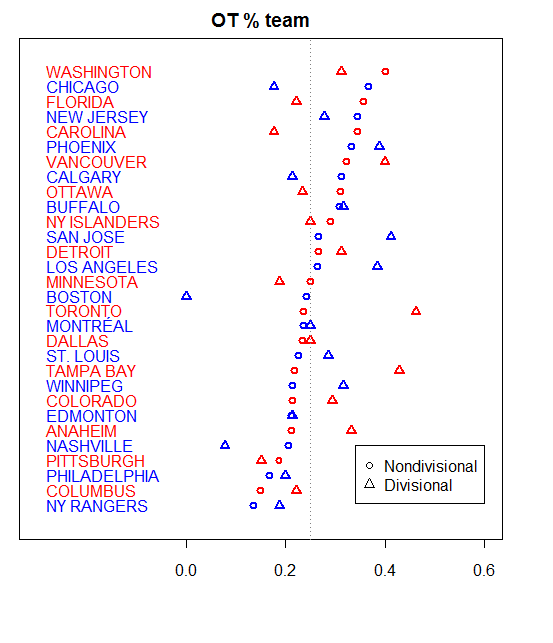 For example, OT rates in nondivisional games are only a few percentage points higher than divisional games (this is a lower effect than I anticipated). This graph depicts the probability of OT by each franchise, by each game type, and arranged in order from teams with the lowest divisional game OT probability to the highest.